Bømoen has very distinctive and site-specific values that conform a complex identity consisting, among other things, of a historical and preserved military camp, a small airport and an adjacent industrial area. 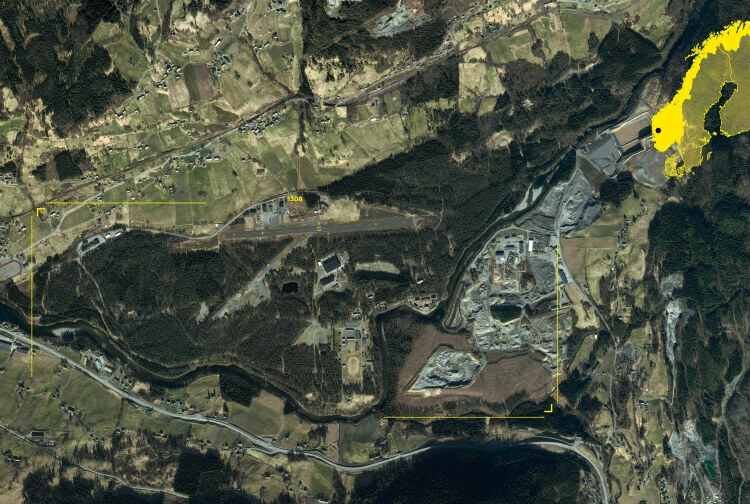 Bømoen has a very central location at Voss, and has a history as a governmental defense-force property with active shooting and exercise activity for over a hundred years. Simultaneously, large parts of Bømoen has been open for the public over a long-time period. The Norwegian defense force has for over 10 years had an active policy about disposing and selling property, buildings and facilities which are no longer needed. Since 2001 over 2,6 million m² building mass has been distributed throughout the whole country, and in 2012 alone 143 000 m² was disposed. As a comparison, Bømoen contains a building mass of 21 000 m². Such disposal processes lead to a multitude of local challenges linked to the transition from military to civil use, change in ownership, changes of different terms etc., and in almost all cases there is a need for comprehensive regulation processes to clarify future uses and activities. This applies also to Bømoen, and therefore a process has been initiated to area regulate the property. It is however uncommon that regulation processes of the scale of Bømoen with its about 2.3000 daa are implemented. In addition, Bømoen includes a diversity of qualities and resources such as a valuable bio-diversity with a river, forest and vegetation which make up the framework of Bømoløypa, a popular trail for hiking and skiing. The military complex represents a unique military history with great a value as national cultural heritage. The airport, the hangars, Voss technical workshop, the rest of the building mass and the different outdoor areas are and have been very important for both the commercial business community and non-commercial organizations, and represent as a sum an extremely broad and diverse activity which has been going on parallel to the ownership and use of the defense force. On one side companies associated with concrete, industry, transportation, mass storage, various industries and offices plus the NPRA. On the other side, different clubs, associations and activities such as parachuting club, flight club, summer school, football cups, paddling etc. Furthermore, Bømoen also has very characteristic and site specific values such as reserve water source of great local value, and gravel occurrences of a significant scope on national scale. Bømoen has today many established user-groups and tenants resulting from the combination of unique and sought-after qualities, central location and an open attitude from its former governmental owner. In comparison, defense properties around the country are often very enclosed and demarcated surrounded by perimeter protection and limited access. The local “ownership” and the open access to Bømoen is therefore rather unique for Voss, and Bømoen has here almost worked as a state common land. After it became known that the Defense Force would cease its activities and dispose Bømoen in 2011, and after Bømoen AS took over the land 1. June 2013, there has therefore been many expectations and insecurities around what will be the future of Bømoen. Today’s new owners wish to continue the existing qualities and uses, at the same time as one wishes to look further into the future with a larger perspective. The local resources and qualities represent possibilities and potential which point beyond current uses, especially in regard for the development of Voss municipality in a regional context, something which is already emphasized by the County Governor of Hordaland. Due to currently not having enough knowledge about what kind of consequences different alternative future uses and developments has for the environment and community, there is a need to undertake thorough and broad impact assessments. This will be done in a cooperation with Voss municipality, planning consultants and different specialized circles. Different alternatives will be investigated to insofar as possible illustrate different possibilities, values and challenges. Broader impact assessments will yield a knowledge based foundation for decision making, so that solid and comprehensive professional evaluations and robust political decisions can be undertaken. These are the prerequisites for a long-term sustainable development of Bømoen.